Want to know how to drive an automatic car but confused as to how the gears are operated? We've put together this handy guide to explain how automatic transmission works. It is often felt that it's much easier to drive an automatic car, rather than a manual one. 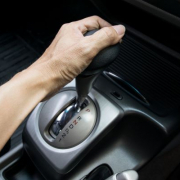 Vehicles with a manual transmission require that you change the gears by operating the clutch and gear stick, but in an automatic car, (using automatic transmission) there is no clutch pedal. This means that the transmission system senses when it is necessary to change gear, and does it automatically without the need for you to use a clutch pedal, or a gear stick. Driving is much easier in an automatic vehicle, and it allows you more time to focus on the road ahead. But there are things you should know about driving an automatic car. Firstly you will notice a different gear lever layout: usually something like P – R – N – D – 2 – 1. P – Park. This is used for parking and locks the transmission. Only use it when stopped and remember that in some modern cars, unless you're in 'P' you can't turn the ignition off. N – Neutral. This is the same as if you use neutral in a manual gearbox. The automatic transmission system will sense the road speed increase and change to a higher gear, then changes down a gear when it senses a lower road speed. It will also change down when you are going uphill because the load increases on the engine and a stronger gear is required. However, when going downhill the car will pick up speed and the transmission will sense the higher road speed and try to change up to a higher gear. This is not useful as a lower gear is required on downward gradients. The driver can override this feature by manually selecting a lower gear (1 or 2) to maintain speed control on the hill. This is useful when going down a steep hill, manoeuvring, driving on icy roads, or in heavy traffic. Sometimes you need quick acceleration, maybe to overtake another vehicle. In a manual vehicle, you can select a lower gear, for quick acceleration. However, in an automatic, to get this change down of gear, called 'kick-down', you need to sharply press the accelerator pedal right down. This causes the quick down change of gear and more power for accelerating. When the need is over, just ease off the accelerator and the car changes up gears again. Always apply the handbrake when you are stationary in an automatic car. In P or N, the car will not drive, but the handbrake will keep it still. However, if in any other gear, the car will drive off under power if you touch the accelerator pedal, purposefully or by accident unless you have the brakes on. Creeping is when the car moves along very slowly, on tick-over speed. This can be stopped by braking, and by the use of the handbrake. However, creep can be useful for slow traffic conditions, as you would use clutch and brake control, in a manual transmission vehicle. It is unwise to use creep to keep still on a hill, as it might let you down, literally! So, use the handbrake to prevent rollback. When driving an automatic car, you would mostly use the right foot only for braking or accelerating in normal driving conditions; as you would in a manual vehicle. If you need to do some manoeuvring, it is ok to use both feet lightly; left on the brake and right on the gas. Driving an automatic car can be strange to begin with, but study your vehicle, practise driving and learn to anticipate the need for the early release of the gas pedal, and progressive braking. Remember, slowing down to take a turn or bend in the road can trick the transmission into changing down a gear as you approach. So, learn to slow down before you reach the corner, easing off the accelerator gently as you turn. Remember that an automatic car, as with any other technological or computer-aided wizardry will not compensate for bad driving techniques on the part of the driver.